LANSING — Dollar signs abound in a renewed debate this spring over when Michigan schools should be able to start their academic years. A bill that would lift the state’s general ban on school starting before Labor Day advanced out of a Senate committee in March. But the bill, Senate Bill 271, is facing opposition from business groups that argue that the 10-year-old Labor Day law has spurred millions of dollars in spending on tourism. Those business groups have aggressively courted allies in the Legislature. According to the Michigan Campaign Finance Network’s review of disclosures, seven business groups that have spoken out against changing the post-Labor Day law have combined to spend about $1.4 million over the last five years in support of current lawmakers or their connected fundraising committees. School groups that support changing the current law have also made contributions — albeit a fraction of the contributions the business groups have made — according to MCFN’s review. Three political action committees (PACs) connected to groups that spoke out in support of the new bill to change the law have given about $51,100 to lawmakers and their connected fundraising committees. Citing polling data and studies on the law’s economic impact, business groups have been successful in protecting the post-Labor Day start requirement since it was approved by the Legislature in 2005. But there have been many attempts to change it. Former Rep. Paul Muxlow, a Republican who served six years in the House, introduced a bill to lift the pre-Labor Day ban in 2016. Muxlow acknowledged the “substantial strength and lobbying” on the other side of the issue. “Until some things settle in their minds, they’re winning the battle,” Muxlow said. Muxlow, who worked in education for 28 years, said he’s argued that extra-curricular activities and athletics that start before the first day of school already prevent families from leaving their home areas before Labor Day. Muxlow said he made that specific argument to one of his colleagues in the Legislature. The list of groups whose giving MCFN tracked for this story was based on those that took a formal position on Senate Bill 271 during a Senate committee hearing on March 28. The bill, sponsored by Sen. Marty Knollenberg, a Republican from Troy, would allow all schools to start before Labor Day but would still prohibit them from being in session on Mondays and Fridays in August. Currently, some schools can already qualify for waivers to start before Labor Day. The Senate Education Committee voted to advance Knollenberg’s bill to the full Senate. However, about 40 businesses, trade associations and other business groups have come out in opposition to the bill, including the Michigan Chamber of Commerce, according to committee minutes. The Michigan Chamber of Commerce’s president, Rich Studley, has attacked the bill on social media, and the chamber has also sponsored Facebook ads against the bill (pictured above)..
“Anti-business bill does nothing to improve education quality! 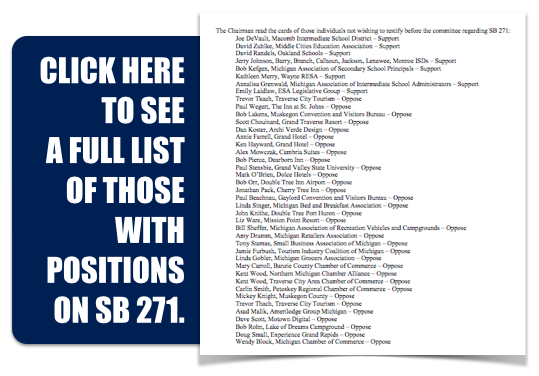 We strongly urge Michigan Senate to send SB 271 back to Committee or kill it!” said one of Studley’s tweets. Of all of the interest groups taking sides on the bill, the Michigan Chamber’s PACs are the most active political donor. 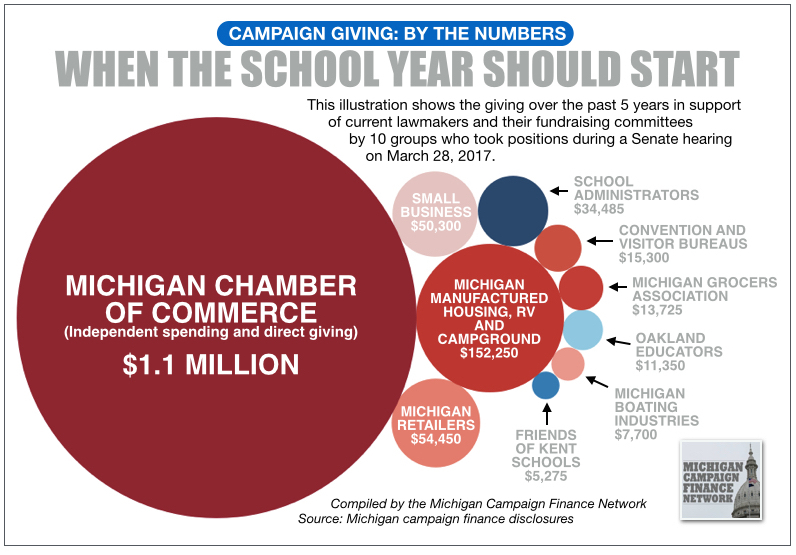 The Michigan Chamber’s PACs have given or spent about $1.1 million in support of current state lawmakers and their committees over the last five years, according to MCFN’s review of state disclosures. But the chamber isn’t alone in its opposition to the bill. 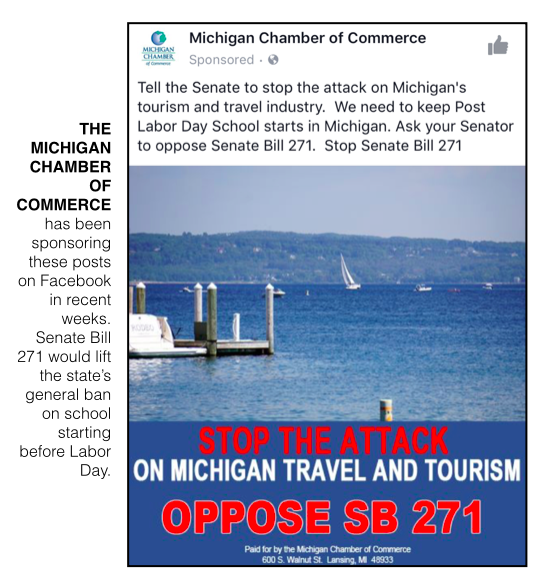 The Michigan Boating Industries Association PAC, which has given about $7,700 to current lawmakers, the Michigan Small Business Association PAC, which has given about $50,300, and the Michigan Association of Convention and Visitor Bureaus PAC, which has given about $16,800 are also opposing the bill. The Michigan Grocers Association PAC, which has given about $14,725, the Michigan Retailers Association PAC, which has given about $54,450, and the Michigan Manufactured Housing, RV & Campground Association PAC, which has given about $152,250, are in opposition as well. Then, there are the individual businesses. For example, executives for Mackinac Island’s Grand Hotel have given about $11,325 to lawmakers over the last five years. A Grand Hotel representative opposed the bill in committee. Over the last 10 years, business groups have shared polling that showed about 64 percent of participants supported the current Labor Day law. They have also argued that changing the law would hurt them financially and would hurt their ability to find workers. That’s the case with the amusement park Michigan’s Adventure. But former Rep. Ed Gaffney who sponsored the 2005 bill that implemented the start date requirement said business revenue was not his original concern. Gaffney, a Republican from Grosse Pointe Farms, said he introduced the bill after hearing complaints from friends about their local schools’ start dates. The Michigan Education Association (MEA), a labor union that represents Michigan educators, was in opposition to Gaffney’s original proposal, he said. However, the MEA didn’t take a position on the new bill to change the law during the Senate committee hearing in March, according to minutes. The MEA also doesn’t have the new bill on its website’s legislation tracker. Over the last five years, the MEA’s main political action committee (PAC) has given about $467,965 directly to current state lawmakers and their connected fundraising committees. The side of the debate supporting Senate Bill 271, which includes the Michigan Association of School Administrators, has argued the pre-Labor Day ban isn’t based on educational best practices and has said that school districts should be able to decide for themselves. During the March committee hearing, Knollenberg said his bill would put Michigan on par with the rest of the country. In committee, the Michigan Association of School Administrators, Oakland County schools and a group that represent Kent County schools took positions in support of the bill. The School Administrators PAC has given about $34,485 to current lawmakers and their parties over the last five years. 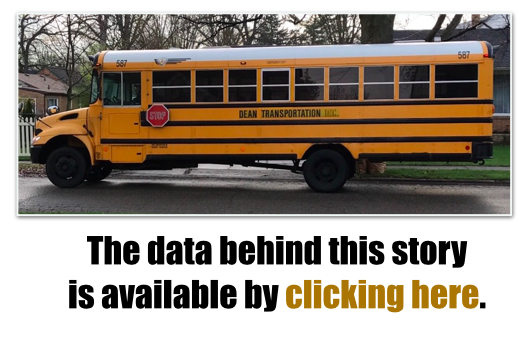 A PAC connected to Oakland school leaders, Oakland Educators, has given $11,350, and a PAC connected to Kent County schools, Friends of Kent County Schools, has given $5,275. Rep. Andy Schor, a Democrat from Lansing, sponsored a bill during the 2013-2014 session to lift the ban on school starting before Labor Day. He said according to the tourism industry’s own polling, about 35 percent of people would support changing the start date. Those people and their school districts should be able to decide the matter for themselves, Schor said. Schor also said he doubts that changing the start date would have the dire impact that business groups say it would. Creating a longer winter break along with the earlier start date could actually help some tourist attractions, like ski lodges, Schor argued. As for Gaffney, he still supports requiring school to start after Labor Day, he said. He also noted that the law was enacted during an economic down-time for Michigan. Michigan Campaign Finance Network intern Ray Wilbur contributed to this report.